I served the cassoulet with Corfu Salad, which is always a refreshing counterpoint to something rich. A nice light Cotes du Rhone or Beaujolais complement this rich and smokey dish beautifully. Place beans in a large pot and cover with water by 3 inches. Bring to a boil, remove from heat, cover, and let stand for 1 hour. Drain the beans. Add fresh water to cover by 3 inches. Bring to a boil; reduce heat to medium and simmer, uncovered, until beans are just tender but not mushy, 1 1/2–2 hours (time will vary depending on size and age of beans). Drain, reserving 1 cup bean broth. This can be done up to 2 days ahead. Preheat oven to 450°. Heat a small amount of the oil in a large heavy pot over medium heat. Add the sausage and cook, turning occasionally, until golden all over, 7–8 minutes. Transfer to a plate. When cool, cut into 1 1/2-inch slices and set aside. Place 2 Tbsp. oil, leek, and onion in the same pot. Cook, stirring occasionally, until vegetables are softened and light golden, about 5 minutes. Add the garlic and anchovies (if using); stir 1 minute to break down anchovies. Add tomato paste and paprika; stir constantly until paste is caramelized, about 2 minutes. Add reserved 1 cup bean broth, beans, chicken broth, and next 4 ingredients. Season with salt and pepper and bring to a boil. Cover and bake until beans are very tender, about 30 minutes. Add the sausage (and any accumulated juices) to the pot, pressing to submerge. Bake, uncovered, until liquid is reduced and slightly thickened, 45-60 minutes longer. Keep an eye on this so it doesn’t get too dried out. Meanwhile, heat 3 Tbsp. oil in a large skillet. Add breadcrumbs and cook, stirring often, until golden and crisp, about 8-10 minutes. Season with salt and pepper. Sprinkle breadcrumbs over beans and drizzle with remaining 3 Tbsp. oil. 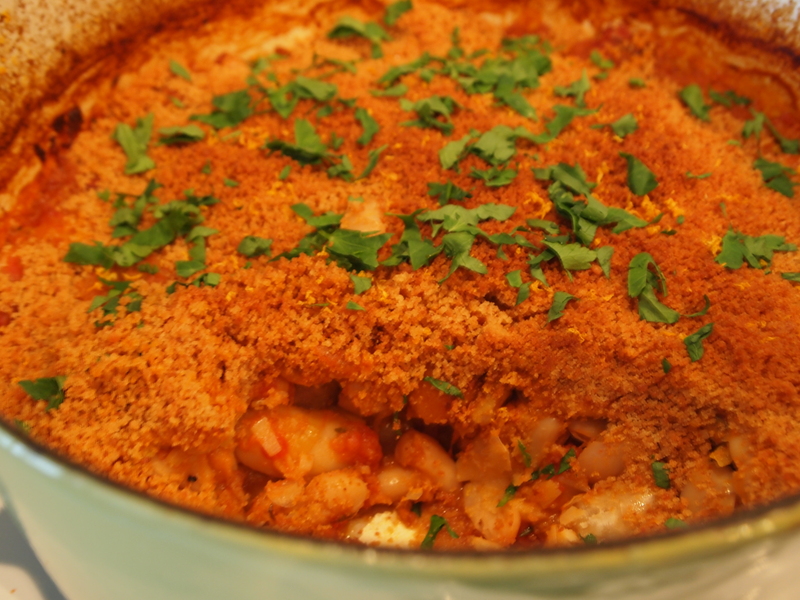 Bake cassoulet until breadcrumbs are browned and liquid is bubbling, about 15 minutes. Let sit for 15 minutes. Sprinkle parsley and lemon zest over just before serving. Cook’s Notes: Don’t be daunted by the long list of ingredients. I would not put this recipe in the “difficult” category, but it does take time. I made the beans on a Saturday and cooked the cassoulet on Sunday. It was a fun project with really great results! Spanish Paprika (Pimenton) is available now at a lot of different supermarkets. Look for the red tin for the imported stuff, or you can buy/order from Penzey’s. It’s delicious in a lot of things, so you won’t regret buying it! Gigantes (aka Gigandes) beans might also be hard to find. We have a great Greek market here that has them in bulk. I found what looks to be an interesting mail order resource for all things beans – they carry Gigantes. They are worth seeking out for their creamy texture and great mouth appeal. About 12 years ago the New York Times Sunday magazine ran an article on Moroccan cooking with recipes for preserved lemons (salt-brined lemons) and harissa (a spicy hot pepper condiment or sauce). This single article opened up doors to flavors, a cooking culture and cooking methods that I had never been exposed to before – and which dramatically changed the way I cook ever since then! 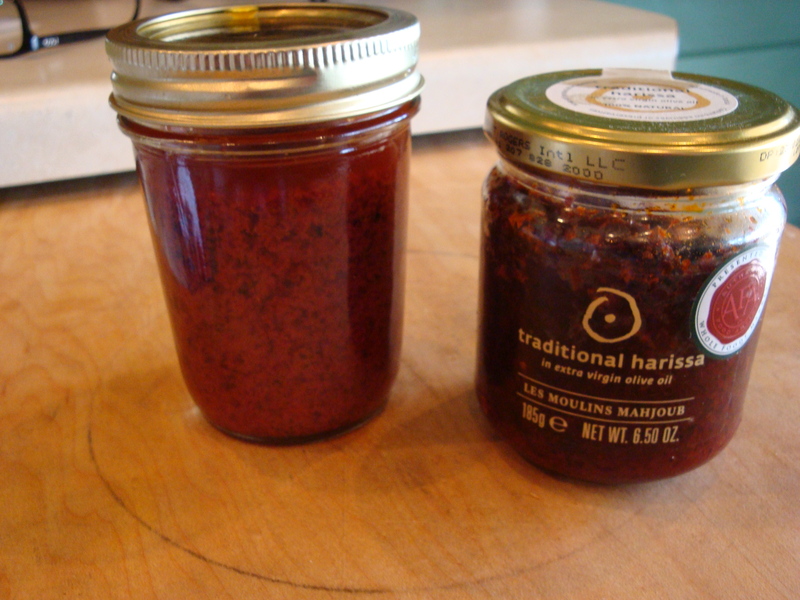 Homemade preserved lemons and harissa really outshine storebought, but if you don’t have the time or ingredients to make one or both of these, Le Moulins Mahjoub and Mustapha’s Moroccan both make very high quality Moroccan/North African ingredients including these two items. Look to kitchen or specialty food stores and your local co-ops. Both are available, as well, through Amazon.com. If Meyer lemons aren’t available (they’re only in season from December-March), you can use regular lemons. 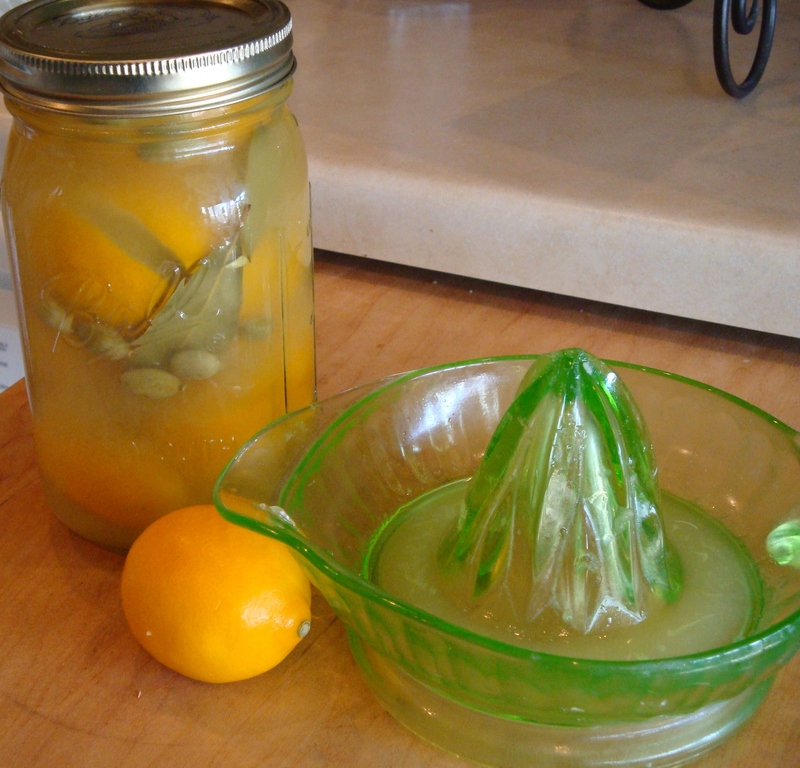 And you can buy preserved lemons in some stores, like Whole Foods, but they’re not NEARLY as good as homemade. This recipe is enough for a one-quart mason jar; adjust amounts accordingly for larger or smaller glass containers. 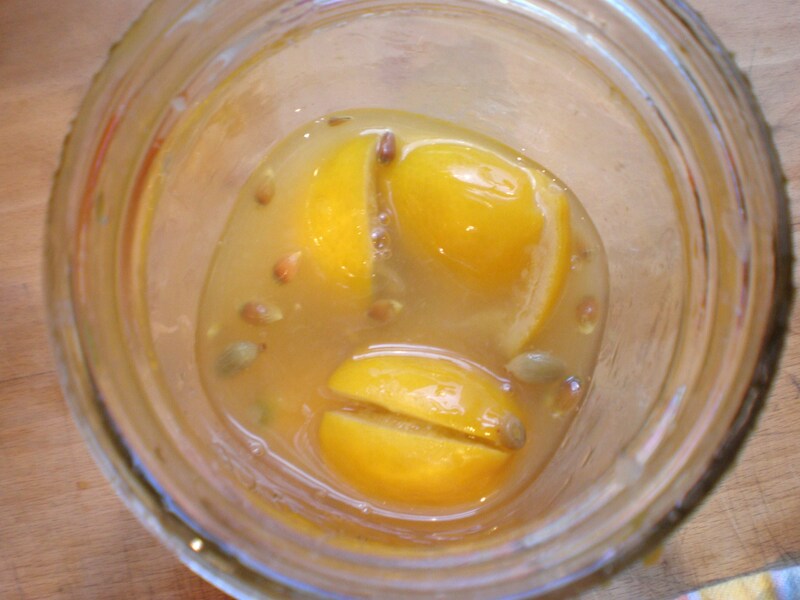 A wide-mouth jar is recommended, making it easier to remove the lemons for use later. Sterilize the jar by pouring boiling water into it. Pour out the water and then proceed as follows. Quarter the lemons from the top to within 1/2 inch of the bottom, sprinkle salt on the exposed flesh, then reshape the fruit. Place 1 tablespoon salt on the bottom of the jar. Pack in the lemons and push them down, adding more salt and the herbs/spices between layers. Press the lemons down to release their juices and to make room for the remaining lemons. Add freshly squeezed lemon juice to cover the lemons. You might find recipes that call for covering lemons with water, but we think using juice creates a better product. Leave a little air space before putting the lid on the jar. Place the jar in the refrigerator and shake the jar daily to distribute the salt. The lemons are ready to use after 4-6 weeks. Most recipes use only the peel. To use, remove the desired amount from the jar and discard the pulp unless the recipe instructs otherwise. Rinse the peel under running water. Preserved lemons will keep up to a year in the refrigerator. The salt brine can be used two or three times over the course of a year. Remove bay leaves and coriander seeds after about 2 months, as they will make the lemons taste bitter over time. NOTE: I have also seen red peppercorns or a slice of red bell pepper put into the jar to add some color. Whisk all ingredients together and place in a small, sterilized jar with a tight-fitting lid. Use as instructed in recipes and pass as a condiment when serving Moroccan Food. This will also keep up to one year in the fridge by pouring a little olive oil over the Harissa after each use to prevent mold. NOTE: There are probabaly as many recipes for Harissa as there are cooks. It’s usually a fiery pepper paste or sauce, but I have also seen sweet versions of this from Tunesia. We enjoy this recipe as well as the Le Moulins Mahjoub and Mustapha’s Moroccan products. I’ve discovered a great local Twin Cities area source for feta and other goat cheese, Singing Hills Goat Dairy. Lynn Reech and Kate Wall raise goats and pigs and make cheese in Nerstrand, Minnesota, a beautiful area right next to one of our wonderful state parks, Big Woods. They sell their cheese at the Mill City Farmer’s Market in Minneapolis which is where I first tasted and then purchased their cheese. In my post on Baked Feta, I mentioned some places you could get slabs of feta cheese, but at that time I didn’t know about Lynn and Kate’s products. I’ve also used their feta crumbles in several recipes, including Chickpea Salad and Shaved Asparagus Pizza. 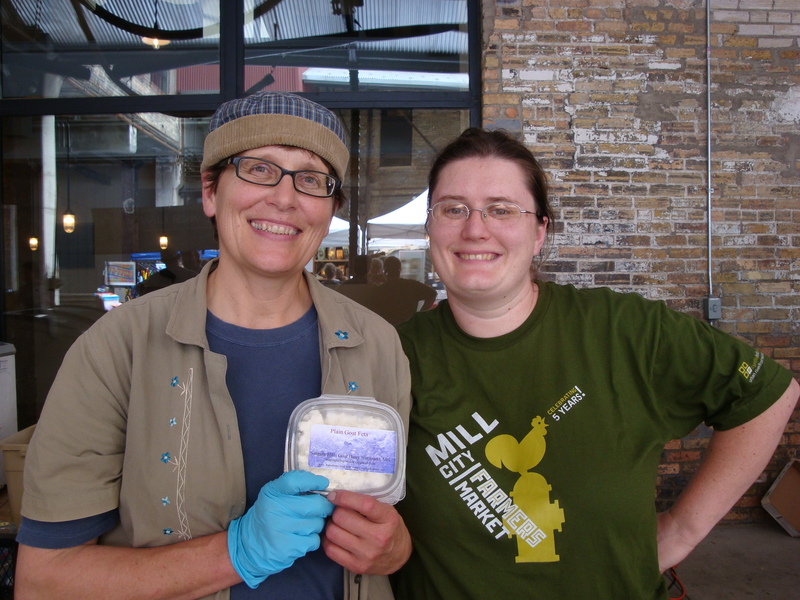 So I encourage you to go out to the Mill City market on a Saturday and get some of this delicious cheese! They’re on the inside portion of the market toward the back. You can also become a fan on their Facebook page.